Home Enlivening Who Facilitates Our Spiritual Growth? Who Facilitates Our Spiritual Growth? Before we are born our Soul works together with our Spirit Guides to map out what our life experience should look like. A careful analyst is made to determine which life lessons will be put to the test in order to bring resolution to those issues, so we can evolve. We carefully filter through all of the Souls that we have previously known in other life experiences, and we choose the ones that will better assist us on our new journey in our new life episode. We make contracts with those Souls to show up when it is their time to facilitate our growth. Most of those contracts that we sign with these other souls, will have an expiry date. Just like signed contracts in real life, there is a start and end date. 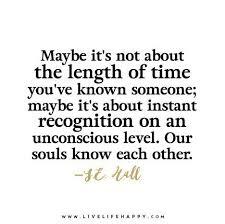 How do we know when we have met one of those Souls we made a deal with? Soul Family is a name we can use to better understand who those Souls are that we choose to be in our life, it is not that all of our contracts will become our immediate family, extended family or otherwise, but in a sense the Souls that play a role in our life are a little like family, we have known these Souls in previous incarnations. When you meet one of these Soul contracts, very likely it will be a synchronic event. The timing will be perfectly aligned with where you are in your life, and what experiences you are having trouble or difficulty with. You might say that these people show up ‘just in the nick of time’, or at least this is how you may reflect on the connection over time. Soul contracts come into our lives exactly when we asked them to, remember before we were born we chose them to help facilitate at a certain time of our life to assist in our growth. Not all of these Soul contracts will be sugar and spice, there will be many that will have difficult and painful lessons to teach us, throughout the time that we spend with them. If you look back over your life, you may be able to see the pattern, or the map this far, take a moment to reflect on the friendships you’ve had that have long since disappeared. Think about a time when a certain friend came into your life, what did you gain from that friendship, and then how did the relationship dissolve? This is how we put the pieces of our life map together, each piece of the puzzle represents a time of expansion and growth for us. If we learn the lesson, then a puzzle piece is earned and we move forward. Soul family seem to come out of nowhere, you might recognize this as you become more spiritually mature, and you may begin to recognize which piece of the puzzle of your life will be assisted by each Soul contract. Keep your heart and Soul open to those you meet by chance, because nothing is a coincidence in your life. Don’t miss out on a fated opportunity to evolve your Soul.